Gamble with no more than your discretionary income. Set your play limit and stick to it. View gambling as entertainment only. Gambling should not be viewed as an income generator. Regret over the amount of money or time spent on gambling. Spending more than you can afford on gambling. Spending money on gambling while financial responsibilities are neglected (neglect of paying bills, rent, etc.). Spending money on gambling while personal responsibilities are neglected (neglect of family, pets, charities, commitments, etc.). "Cutting back" on a necessity (food, medicine, etc.) in order to pay for gambling. Covering up or lying about the amount of money spent on gambling. Purchasing lottery tickets at multiple locations to allay suspicions of sales clerk that you may have a gambling problem. Having a compulsion to purchase tickets regularly; to never miss a drawing of your favorite lottery. Breaking the law in order to get gambling money or recover gambling losses (stealing, fraud, etc.). Asking for financial assistance as a result of gambling. 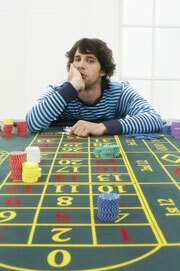 Continued gambling despite negative consequences: loss of job, relationships or opportunities. Denial of a gambling problem or lying to friends or family about behavior. Rationalizing one's gambling, or believing that this list of Symptoms of Gambling Addiction does not apply to you. Remember, "rationalize" means "rational lies". Gambling addiction is a continuum, from "at-risk gambler" to "problem gambler" to "compulsive gambler". Matching even one symptom, listed above, is a red flag. The more symptoms you match, the more addicted you may be.